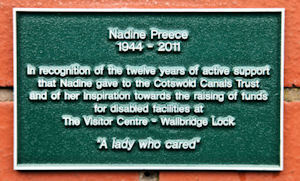 The Cotswold Canals Trust Visitor Centre is now accessible to people with restricted mobility. A UK manufactured, exterior grade, public access, stainless steel tower lift has been fitted to the Centre’s entrance balcony at Wallbridge Lock. “When the Trust took on the project we always knew we had to provide wheelchair access." "We took advice from Phil Hughes of the Stroud & District Access Group." The wheelchair lift project also allowed the upgrading of the entrance stairs & balcony and the lock side access. The project will be completed with the fitting of a hearing loop system in the retail area and a baby changing unit in the disabled toilet. The project was entirely funded from outside sources thus avoiding the use of funds required for the canal restoration. Beta Marine, the Gloucester based Marine Engine specialists, who have long supported the Trust, made a single large donation. Beta Marine representatives, Lawrance and Karen Talbot are pictured above meeting The Princess Royal at the Centre in February 2012. The Langtree Trust, a Stroud based charity, also assisted the project. The middle picture shows John Preece with Lawrance and Karen Talbot. The bottom picture shows Ben Smart & mother Ginny from Stonehouse on a recent visit to the Centre. A substantial number of donations to the project were received in memory of Nadine Preece. Nadine was a volunteer with mobility issues who had worked at the Heritage Centre Saul for many years and at the Wallbridge Centre since its opening in August 2010. Nadine died in May 2011. Click on the John Preece picture to view the commemorative plaque installed near the lift. “We learnt a lot from this project. Nadine taught me how to use a wheelchair while the surveyor pointed out the benefit of proper handrails. We also enjoyed working with local businesses, organisations and our own volunteers." "Gloucester Street Forge, from Stroud, had some early morning starts in order to enlarge and adjust the access balcony outside opening times." Click on the icons below to find out more about the companies involved.